There was no margin for error, and Daniel Boone was the team that found a way. A sixth-inning sacrifice fly off the bat of Megan Ackerman — who also dominated in the circle — provided the difference in a 1-0 victory over Knox Farragut in the East Tennessee Classic softball tournament Friday at Winged Deer Park. Boone improved to 8-2 on the season. Ackerman delivered a three-hit shutout in the circle, striking out nine batters. “We knew coming in they were a good team,” said Ackerman. “They beat David Crockett, and that’s our rival. We were ready to go. Jenkins said Ackerman had a nice approach. Brylee Mesusan started the sixth inning with a leadoff walk. She stole second, and was sacrificed to third on Jaycie Jenkins’ bunt. That brought Ackerman to the plate. Ackerman delivered a fly ball to center field that was deep enough to score Mesusan. Farragut pitcher Lakyn Moore took the hard-luck loss. She allowed just two hits with three strikeouts and three walks. Among the other games, Science Hill crushed Cloudland by a score of 13-0 and also topped Sullivan South by a 17-0 margin. The Lady Trailblazers made it two in a row with Greyson Stevens homering as part of a 13-hit attack. Jaycie Jenkins totaled two hits and three RBIs. Camryn Sarvis added a pair of hits. Bree Presnell authored a perfect game for the Lady Hilltoppers in the five-inning rout. 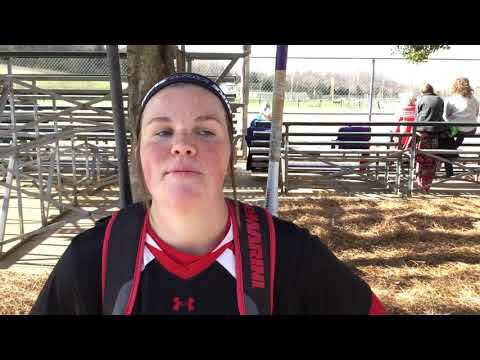 Jannon Glaspie hit a pair of homers to pace the Lady Hilltoppers. Morgan Riffle, Peyton Domby and Emma Allgood each drove in a pair of runs as the Indians built a 7-0 first-inning lead and never looked back. Riffle and Kassidy Miller combined on a five-hitter, totaling nine strikeouts in five innings of work. Ryleigh Owen had two hits for the Lady Buccaneers. Leading 6-0 heading to the bottom of the fourth inning, the Lady Pioneers had to hold on for the win. Riley Hope and Kara Weems did damage at the plate, each totaling three hits and two RBIs. Hope scored three runs. Maddie Roy added two hits. In the circle, Weems struck out 12 batters. Mackenzie Baldwin drove in two runs and Jenna Davis tossed a four-hit shutout. Matty McKee had two hits for Crockett. Cierra Sutherland had two hits for Happy Valley. The Lady Blue Devils scored seven runs with two outs in the bottom of the fourth inning to overcome a one-run deficit. Carly Kinsler homered and had five RBIs as the Lady Blue Devils rallied from a pair of early deficits. Betsabe Chavez had three hits while Cassie Selvage and Halie Hawkins totaled two hits each. Caroline Podvin had two hits and five RBIs as the Lady Blue Devils rolled. Kiley Bennett, Rachel Hatcher, Bella Bogart and Kirsten Buchanan each had two RBIs while Gabby Davis had two hits. Unicoi scored at least four runs in each of its four times at bat. The Lady Patriots pushed across a pair of runs in the bottom of the sixth inning for the come-from-behind win. Chelsea Sams homered for East while Kylee Wolfe totaled two hits. Chelsea Sams went 4 for 4 with a homer and four RBIs as East built a 13-2 lead. Katelyn Loudy went 4 for 4 with four runs scored. Kylee Wolfe and Emma Timbs each had two hits with Timbs driving in three runs. The Lady Warriors rallied for seven runs in the fifth inning. Down 9-4 heading to the bottom of the fifth, the Lady Rangers rallied for the win. Unaka scored five in the bottom of the fifth, and then pushed across a run in the bottom of the sixth.